Is there availability of free WI-FI at Midway Airport? Travelers at the Midway Airport can enjoy free access to Wi-Fi but only for a few dozen websites. The Chicago Department of Aviation and Boingo (the airports’ Wi-Fi provider) have inked a deal that allows free access to more than 30 websites offering news, weather, shopping, etc. What terminal is Southwest at Midway? The Concourse ‘A’ of Chicago Midway Airport serves the Southwest Airlines, Porter Airlines, Delta Airlines, Frontier Airlines, Northwest Airlines, and Air Tran. It contains gates A1-A19. Is there any cost attached to park at Midway Airport? 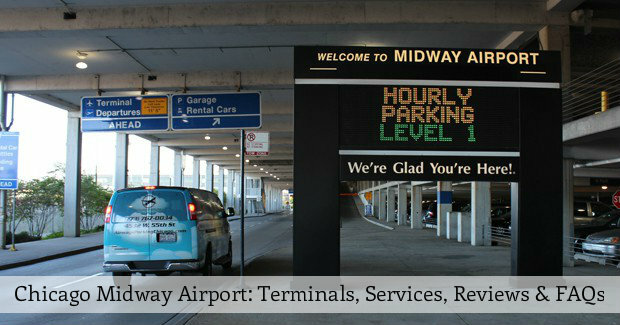 The Chicago Midway Airport provides Complimentary Shuttle Bus Services 24 hours a day from the Economy Parking Lots and Economy Parking Garage to the Terminal Building. For Long-term parking, you need to pay around $15 per 24 hours i.e. for one day. What restaurants are at Midway Airport? You can enjoy the services of a number of restaurants at the airport on Concourse A and Concourse B. There are no eat-in restaurants or bars at the Concourse C. You can find options like Ben and Jerry’s, Gold Coast Dogs, McDonalds, Hudson’s Euro Cafe, Illinois Bar and Grill, Oak Street Beach Café, King Wah Express, Pegasus On the Fly, Manny’s Express, Potbelly’s, Reilly’s Daughter, Nuts on Clark and much more at the airport. What time is midway airport open? ​The timings linked to the TSA checkpoints at Midway International Airport are 3:30 am to 11:00 pm every day. Taking about the TSA Pre checkpoints, these are open from 4:00 am to 8:00 pm every day. ← Chicago Midway International Airport Reviews, Baggage Policies, & Specific Allowances!